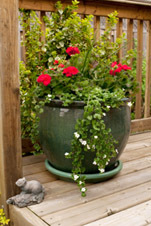 Plant containers are available in a large assortment of materials, styles, and sizes. They add color, texture, and style to your interior décor, and your exterior landscape. Some materials are better suited than others. The best container choice will depend on the size and watering requirements of your plants, as well as where your plants will reside. 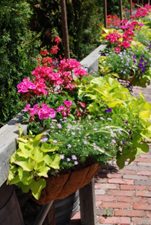 Choosing the right planter will ensure your flowering and foliage plants will bloom and prosper. 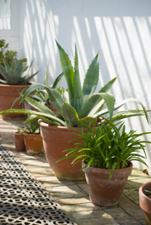 Selecting the right containers for your tropical plants will promote plant health, as well as save time and money. A plant in the wrong container might require additional care, repotting, or even need to be replaced. Size - An excellent container is large enough for soil and roots, has good drainage, and has sufficient room for growth. A container that is out of proportion with the plant (too large or small) will have an unbalanced appearance. Drainage – A drainage hole allows excess water to run out the bottom of the container. If the container does not have a drainage hole, place a layer of gravel and/or stones in the bottom (underneath the soil). Proper drainage protects against over-watering and allows excess salts to wash out the bottom of the plant container. Note: Place a tray beneath containers to protect carpets, surfaces, and furniture from water/moisture damage. Location – Will your plants reside indoors, outside, or both? 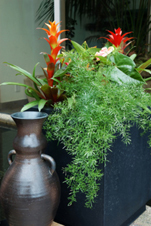 Consider the location and portability requirements of your plants when selecting a tropical plant container. 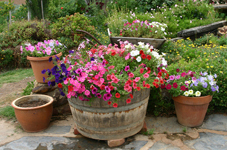 Plant containers come in a variety of materials and styles. A wide range of containers are available for both indoor and outdoor tropicals. Tropical plants and flowers will thrive if you choose containers made from materials that are suited to their needs. 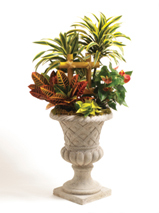 Some tropicals will need sturdy tropical plant containers due to their height and weight. Keep in mind, non-porous planters should have adequate drainage to prevent over-watering. Ceramic plant containers come in many colors, finishes, and textures. They make a beautiful addition to your garden, landscape, or home. Ceramic containers are prone to chips and cracks, especially in cold temperatures, so be sure to handle with care. 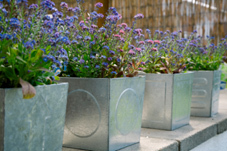 Metal containers are durable and their beauty increases with age. When choosing this type of container, bear in mind metal can get very hot if placed in direct sunlight. Also, metal is susceptible to rust, and might need to be treated with a rust resistant coating. The natural beauty of wooden containers enhances entryways, balconies, and patios. Wooden planters unify design when paired with complimenting pieces made of the same wood (seating, trellises, or storage). Concrete planters are ideal for large outdoor plants, shrubs, and trees with large root systems. Their weight and size discourages theft of valuable tropicals. Heavy duty concrete containers protect plants from extreme temperature changes. 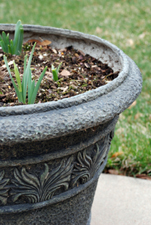 Genuine stone planters are durable and age beautifully; however, real stone planters can be pricey. Consider using containers made out of modern materials that look like natural stone (limestone, fiberglass, and polypropylene). Fiberglass planters are a popular choice because they are lightweight, durable, and come in a variety of colors and styles. They are made to simulate the look of natural materials such as clay, terracotta and stone. 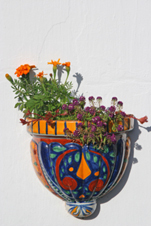 Planter style, shape, color and texture all contribute to a pleasing design. Combining tropical plants with the right plant container style will create a distinctive design that enhances your home and landscape. Consider using wall-mounted plant containers to display your tropical plants on the exterior walls of your home, or along a fence. Before mounting a wall planter indoors, check the manufacturer’s recommendations to make sure it is appropriate for indoor use. 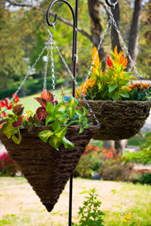 Hanging tropical plant containers are ideal for displaying cascading blooms and foliage. They do require a little extra care. During the summer, they should be watered frequently. Fertilize regularly to keep flowers blooming and foliage lush and green. 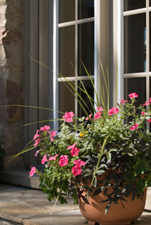 Enjoy a tropical view outside your window by planting exotic flowers and leafy foliage in a window box. 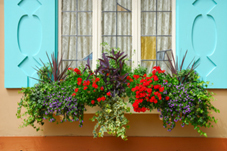 Consider mounting window boxes to add beauty and color to your home as well as add extra planting space. Add deck railing planters along a deck, balcony, or porch railing to increase planting space. 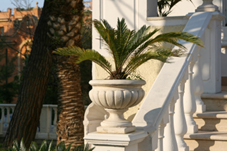 Railing planters include straight, corner, and stackable. 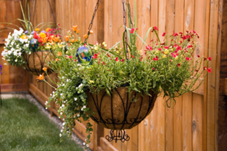 Be sure railings are secure and can support the weight of the railing planter(s) you select. Self-watering planters reduce the frequency of watering tropical plants. A reservoir is built into the bottom of the planter to hold a limited supply of water. 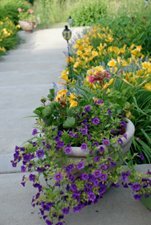 Style and material choice is more limited than standard planters. This planter is ideal for gardeners on-the-go!